I Just got a chicken dinner in pubg in solo. My first win, I've never shouted yes after winning a game before but I was so excited I'm sure the neighbors heard it. Feelsgoodman. Bought my kids a Thrustmaster force feedback wheel for xmas. So much fun I'm resisting to urge to get one of those cockpit setups. Forza Horizon is pfg. 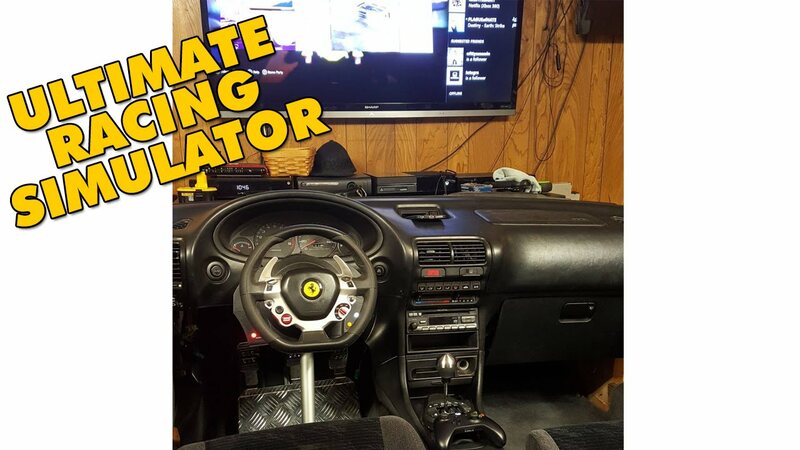 Although tacky and it taking up a huge amount of space I've seen a similar install where the guy had removed the passenger side but kept the center console and insturment panel like the picture below. Pretty neat setup! I think he also had his flat screen mounted where the windshield would normally be. Original cd and big-box, iso'd and playing through Dosbox. Thats ridiculous. I was thinking of somthing like this. If you're gonna do it, Do it big! No, it's actually really good. Shocker. So good. Its Parkour Racing with Mario Kart power ups. Pretty insane. Picked up the new Civ 6 expansion, Rise & Fall, so started a new game last night. Really liking it so far, although 6 does still have those irrational AI moments in the early game when a bunch of civs will declare war on you for no apparent reason. 's okay though. I left it last night having bullied two of them in to peace and am in the process of teaching Robert the Bruce a valuable lesson about declaring war against England twice when we've been nothing but nice to them. I'm going to take two of his cities, raze one, then leave him with one, surround it and stifle his growth for the remainder of the game. Never played Beyond Earth, but there's a lot to like with 6. The AI models and animations in particular are stunningly good. They also shamelessly nicked a few ideas from the great Endless Legend, like city governors and districts. The base game also came pretty much feature-complete in that it incorporated all of the features that 5 had after being expanded. Interface is a bit gash mind you. I hear the Dutch are a faction in Civ6 now. Who's their leader? Willem van Oranje? For a change. Every Civ had Willem van Oranje as their Dutch leader. Especially in Civ4 which had multiple leaders per Civ the Dutch were shafted with just one. ps Wilhelmina was a badass. I honestly know nothing about her, but I'm sure Civ will pique my interest at some point and get me to at least read her Wiki page. since the PoE season ended, decided to give SotA a try, from Lord British himself. started and finished Inside yesterday. Basically another LIMBO game, yet is able to surprise once more. Brilliant game. Loved it. And yes...WTF indeed. I watched a Let's Play of it to see what it was about. This guy playing was so amusing that I was totally engrossed with it and ended up watching the whole thing from start to finish. It looks amazing. The atmosphere is so good and many of the game play ideas are really original. I do think, however, that if I had bought the game and played it on my own I would've found it greatly frustrating. I'm terrible at figuring out puzzles like what this game throws at you. my heart was about to fail. I find the trick that really helps in the last circle is stripping your kit off and going prone. Yeah... it's a bit of a gamble at the end I find. That's one option, I have definitely made others that do that in the end game pay but I know I've definitely been had by people laying down too. Nowadays, I try to find a building and go for it no matter who's inside. If I'm outside, I'm usually doing the dance so I don't stop moving. Laying down is something I do extremely rarely these days and even then, I've been shot a few times doing it. You have to keep in mind that people far enough away from you will not see the grass and will just see you laying down. It's very obvious and an easy shot. Cover is always king like rocks, tree's and buildings mainly. If the final circle has a beach/ocean on one side of it I'll always try to approach from that area as there's less chance of people sneaking up behind me and I almost always try to keep moving and never stop. My final circle wins usually come from having taken and controlling a house. Oh also I've been playing Sea of Thieves. That game is freaking awesome, best water physics I've ever seen.